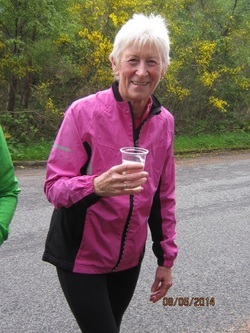 It was back in July 2012 when Janet was running Bewl 15 that she got talking to Jacqui who had just comeback from her 'Running the Highlands' holiday. Janet happened to mention that she would reach 70 in December 2014 and wanted to celebrate by having an adventure! The seed of an idea was sown! Could she run 85 miles from Inverness to the Isle of Skye in 5 days? Could she persuade friends to go with her! Well, the answer to those questions was yes and Jacqui, Dave, Chris, Sherrill, Mike & Gill all signed up with enthusiasm! As all runners know injury can strike at any time and Chris & Gill went knowing they would have to run/walk most days whilst enthusiastically supporting the others. The group were met at Inverness by their guides Neil, Ruth & Claire who outlined the run sections for the first day. These were to be an initial 5 mile run, stop for a drink at the mini bus, followed by an 8 mile run; break for lunch, then an 8 mile section in the afternoon. (21 miles total). The first rule when running such an event is 'Stick to your eating regime' so what possessed Janet to have a full cooked breakfast that morning instead of her usual porridge is anyones guess - suffice it to say Janet was regretting it at the tea stop, wondering what she had got herself into! The afternoon run followed a trail through a beautiful pine forest & the first glimpses of Loch Ness! Gill walked the 8 mile section with a few verbal instructions & a map for company. Gill is the first one to admit that she has no sense of direction and it is a wonder she was ever seen again! However, the group all reformed in the village of Drumnadrochit on the west shore of Loch Ness feeling buoyant after their first day. The first three nights of the adventure were spent at Hotel Tomich, 45 minutes drive from Inverness on the edge of the beautiful Glen Affric nature reserve. Fantastic home made food made from the finest local Scottish ingredients washed down by glass or two of wine was enjoyed by all! Day 2 started in Drumnadrochit and the group ran 17 miles back to Tomich through trails with some more 'boggy' bits thrown in! Somewhat of a tradition on the trip is a wade into the freezing cold river at the back of the Hotel to help aid recovery. Dave Oxbrow was so enthusiastic he almost went for a swim! The evening meal was a welcome sight for all and the group were joined after dinner by Chris Barrett (Sherrill's husband) who was taking the opportunity of spending the week riding around Britain on his motorbike. Day 3 was a start outside the Hotel with a relatively easy 9 miles to run. However, the accumulation of mileage caught up with Sherrill who had had a niggling injury before the trip and unfortunately for her after succeeding in running 47 miles in 3 days had to finish her quest. She has vowed to return another time to 'Run the Highlands' again. Todays run finished with a lovely picnic at Glen Affric. A packed lunch was provided every day by the Hotel along with lovely cups of tea, coffee, jaffa cakes and highland biscuits from Neil in the minibus. In the afternoon Neil, Ruth & Claire took the group to the beautiful Plodda Falls (4.5 miles from the Hotel). The falls are 46m high and a popular tourist attraction. They are on the Allt na Bodachan which eventually joins the River Affric. On the trip Neil pointed out an ant hill and demonstrated the Way the angry ants squirt formic acid when they are attacked (in this case by Neil's hand smacking the hill). Day 4 started by packing up the minibus with all the group's luggage ready for the move to Hotel Tingle Creek in Kyle of Lochalsh. This was the day the group were looking forward to with a bit of trepidation! A 21 mile run from yesterday's picnic site up to Morvich/Kintail with no backup from the minibus due to the terrain. Neil had said that the weather could change rapidly on this section and the group were to take wet weather gear plus hats and gloves just in case. 4 miles into the run a break was taken at the delightfully named 'Strawberry Cottage'. After a quick snack and drink the group set off again in rather wet weather. Skirting the Glen Affric Forest stopping for another short break at the Youth Hostel at Alltbeithe, reputed to be the most northern and remote Youth Hostel in Scotland. The rest of the run today was through mountains with very slippery sections, with some very wet feet at the end! A lovely welcome from the staff at the group's new hotel and great food to round of the day. Day 5 dawned, the last day of the adventure and 17 miles to go. At the first stop for a break the group met a shoeless local with a sow and her piglets! Some of the group thought they were hallucinating after a steep climb! The run then took the group to Eilean Donan Castle, a small tidal Island where the Lochs of Duich, Long and Alsh meet, absolutely breathtaking scenery. A section of road to run and then over stiles and yet more wet ground and the group congregated together in Kyle for the final push. A final jog to the bridge linking the mainland to Skye and a photo stop in the middle of the bridge. Neil had organised a lovely glass of 'bubbles' in celebration of the adventure before returning to the Hotel for one final night. Janet was surprised with a birthday cake (& candles!) beautifully made by the hotel. Photos can be view in the Gallery.